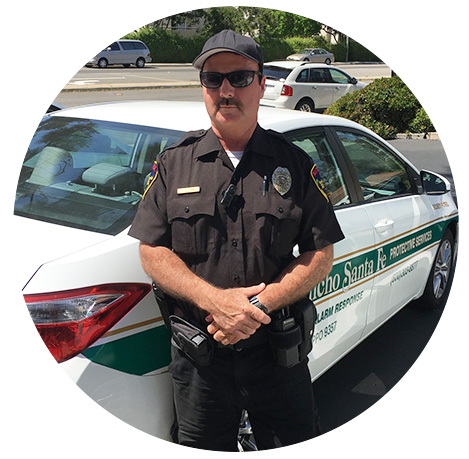 Rancho Santa Fe Security officers wear uniforms that reflect their authority and professionalism. Visibility is a powerful crime deterrent. By their presence alone, uniformed security officers can help enhance your employee’s safety and reduce the risk of vandalism or theft from your property or at your facility. Since 1985 Rancho Santa Fe has combined the best security professionals with the latest technology to benefit our clients through innovation in protection. Whether your location involves extensive customer interaction or faces significant security challenges, we have the right personnel for the assignment. In addition to state requirements, all RSF security officers go through an extensive background investigation, submit to a drug screening and armed officers receive quarterly firearms training from our own In-house instructor. RSF officers are assigned to a location based on their qualifications and experience. The presence of a uniformed security officer provides a substantial deterrent to criminal and inappropriate activity at the location of assignment. A uniformed security officer observes activity, reports any criminal or inappropriate activity to the proper authorities, and documents all pertinent information at the job site. A uniformed security officer enforces designated safety policies, takes action against safety hazards, ensures that property safety equipment is accounted for, and takes appropriate action in the event of an emergency. Within the limits of local and state laws, a uniformed security officer will take all responsible and necessary steps to protect persons and property. Rancho Santa Fe Security Services will customize guard orders for your location to include duties such as locking doors at designated times, checking in visitors and vehicles, searching bags, and any other security-related activity.